So last night I ended up watching a documentary on Stephen Hawking’s life mostly centered around the book A Brief History of Time. What I was kind of struck with is that I actually relate to Stephen. Before I had watched this documentary, I had generally presumed like most of the media have concluded that he was a super brilliant theoretical physicist and also kind of out-of-touch with my world. I may have seen this documentary years ago and not paid much attention. But this time it captivated me as I started to see how some of my thoughts have some similarity to Stephen. Now I’m not saying I’m anywhere as mathematically brilliant as him. It’s just that where before I thought I was maybe 0.0000001% as bright as him — basically zero compared to him. This time I was thinking that perhaps I now at least show up on the radar and am maybe 1% as brilliant. And to be true what I really mean to say is not so much a comparison of brilliance between me and the former Stephen Hawkings but that he and I bore some connection. Even more, I’m saying I’m am more seeing how we are all really one or at least capable of getting to the point that we are all one. Let me summarize some key observations. The documentary talked about the fact that when Stephen lost the ability to write he could no longer use the normal mathematical tools that other mathematicians could use adeptly because that would require him to have a sort of photographic memory where he could write on imaginary paper in his mind and flip back and forth between pages. Instead, he had to resort to perfecting working with geometric shapes, which I presume some of his assistants could start converting or confirming with more traditional equations. When I heard this, I immediately remembered a time in advanced calculus class in undergraduate school we reached a section where we were expected to derive different forms of trigonometric proofs based upon a handful of memorized proofs. I remember the teacher painstakingly taking many steps to complete the proof and then she illustrated the results on a triangle she drew. As I started doing my homework I inadvertently went backwards. I drew the triangle first and rather immediately the triangle completed the proof. I then just had to copy the equations off each side of the triangle and it gave the appearance that I did all the hard work to memorize the equations and come up with the right steps of the proof. I found a secret weapon to “cheat” — except I wasn’t cheating. The way the teacher and book were teaching everyone was rather hard and you had to be smart. The way I did it was rather easy that a grade schooler could do it and not understand what they did but yet do it correctly. I was rather surprised why everyone else didn’t see what I saw, I roughly explained what I did once to my teacher and I don’t think she quite got it. When it came to the next exam I killed the exam with absolute ease with so much extra time to spare. That was so many years ago so I don’t remember to do what I did, but that memory connected with the idea that I could easily picture a triangle in my brain and from that have performed all those hard mathematical steps. The documentary then described a mathematical problem that Stephen Hawking gave to one of his students. The student described that Stephen Hawkings kind of already knew the answer to the math problem based upon his thinking using geometric shapes. The math problem was challenging enough for that student to take a couple months to understand enough to work on it. And when he returned with the solution it didn’t agree with what Stephen Hawking was expecting. So Stephen assumed that the student made some mistake or that he failed to explore other parts of the math problem. So the student rechecked his work but he did admit to not considering other parts of the problem. So the student explored other parts and got the same answer. Steve would then think of another part the student didn’t consider and the student would disappear for a few weeks to come up with the same conclusions. This happened a few more times. The student even worked with others to have a computer to solve the problem quantitatively and the computer came to the same conclusion. After many retries, Stephen Hawking concluded he was wrong. What this meant for me was that Stephen Hawking was in many ways a profound “daydreamer” thinking in high-level concepts about the meaning of life, what is God, how did the universe start and how will it end. As he worked with these high-level concepts he was “cursed/gifted” with the inability to work equations the way a “normal” mathematician with working hands could do things. So towards his later years, he would hand off mathematical problems to students and assistants to prove out what his geometric shapes already showed. In the same way, I used my triangle to breeze thru one challenging part of an advanced calculus class, Stephen used way more elaborate shapes to breeze thru to conclusions left as an exercise for an assistant or student to complete to the expected answer. Usually, the student would prove Stephen correct, but not always. The end result of this was that the original theory that black holes are black was proven wrong. The current explanation that Stephen Hawking had was that as physical matter is sucked down to an infinitely strong black hole at random moments some of the matter and anti-matter parts of the matter don’t always go down together. When this occurs some residual radiation comes out of a black hole even though a black hole is supposed to be so strong that no radiation can escape its gravitational pull. The documentary ended with a bit of confusion for me as to what the current belief of the universe is. In one area Stephen seemed to conclude that the universe never began and always was. But then he ends saying he still firmly believes the universe will end in a big contraction in maybe 20 billion years in sort of a reverse big bang. But if the universe never began that there was no big bang. He also started asking questions of is there a creator referring to the creator as him and what is the purpose of life. As he continued I then felt much more capable of debating with Stephen as he was entering what I consider my realm of life thinking about the purpose, perception, and experience of the human existence. Oh, by the way, I’m about to release my first book Spirituality for REAL: Beyond the Incense and Meditation which I think goes in much more depth into the realm of spirituality then A Brief History of Time. I’ll leave one more note. 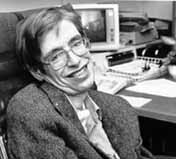 Stephen did also mention that he was seeking a unified theory that explains all things. His firm belief that for such a theory to work it has to be easy enough for anyone to understand. Somewhat about as easy to understand as Einstein’s E=MC2 equation. Maybe even more so. He believed that if we had achieved this unified theory then it would be common ground for philosophers, engineers … everyone to have a discussion and understanding. So in the end quite literally a brilliant actor in a play, an artist in a painting a child with disability overcoming a challenge, a dog giving you a hug may literally be one and the same brilliance as a Stephen Hawking or Albert Einstein doing what they did best.